Hogweed (Heracleum sphondylium) is a species which you can find almost everywhere – it thrives beside ditches, in hedgerow bottoms, in rough grassland, road verges, woodland. It is found, in fact, in many of the same habitats as nettle and, like common nettle, you can eat it! I will make it clear at this point that this refers to common hogweed rather than giant hogweed! Hogweed is a species which is fairly distinctive although a little care is required if you are not all that familiar with it. There are a number of other species in the carrot family which is could possibly be confused with but I have outlined below the key differences you need to look for. 1) Firstly, many other members of the carrot family have feathery or frilly leaves – think of cow parsley or even the tops of domestic carrots. Hogweed will never be thin and fine like these. 2) Never touch any member of the carrot family with red or purple spots on the stems – this will keep you clear of giant hogweed and hemlock which can be very toxic. It will also distinguish rough chervil whose leaves are much finer than the hogweed anyway. 3) Never eat any umbellifer which is hairless – again this should keep you away from hemlock! 4) Look in hedgerow bases and areas of rough grassland – these are favourite habitats. Species with similar leaves can be found on the coast amongst rocks and shingle such as Scot’s Lovage. 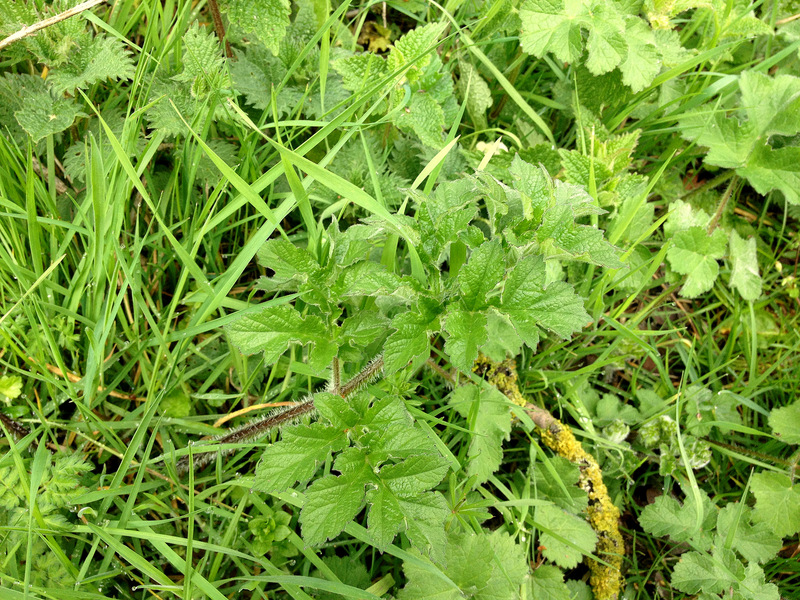 Hogweed leaf arising from grass and ruderal vegetation. The hogweed leaf is centre shot - ignore the nettles above it! 5) Wild celery isn’t a million miles away from hogweed, but is perfectly paletable so no worries there! 6) The leaves are pinnate – that is, leaflets are arranged on either side of the main stem. Each of these leaves is spikey and serrated. Avoid species whose leaves are twice pinnate – that is, they split again. This will keep you away from Wild Angelica which is also paletable so no worries! Sanicle and Astrantia are not pinnate – that is, there are not three separate leaves coming off the stem. 7) The plant should not be huge! Giant hogweed is very poisonous but, like its name suggests, it really is enormous. The only potential risk would be when the giant hogweed was just establishing and sending up the first shoots but a) you should still be able to tell that it will grow into something very large and b) always check for the red/purple spots on the stem, as described in point 4! 8) If in doubt, don’t bother. This is always a good rule to live by but, once you have your eye in, hogweed is a very characteristic species which you can easily identify. There are plenty of photos littered around the internet so use these to cross reference if you need to. So, once you’re sure of your ID, you’re ready to harvest although do be careful, the stems can cause blisters (like nettles, not a problem once they are cooked!) so do wear gloves. The best time to eat the leaves and stems is now, when the plant is young and fresh. Take the younger leaves and strip the leaves; the stalks can be cooked and eaten like asparagus and are particuarly nice if fried lightly with soy sauce and sesame seeds for addition to an oriental-style meal. You can also eat the fresh leaves raw or cooked in a similar way to any other green leaf vegetable – there are recipe’s which substitute it for cabbage such as in Toad in the Hole. A little later in the year, the buds can be picked and cooked – again, fried as part of an oriental-style meal can be delicious. When picking the buds though, always give due care to making sure that the leaves are indeed hogweed – and that the bud does come from the leaves you think they do! Cow parsley for example grows in the same habitats and you must make sure that the flowers aren’t crossing over.